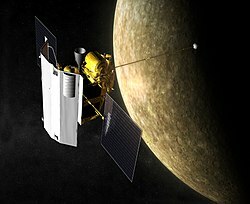 MESSENGER, MErcury Surface, Space ENvironment, GEochemistry and Ranging, was an unmanned NASA and APL spacecraft. It was orbiting and studying the planet Mercury. Its mission lasted 10 years, 8 months and 28 days. It was launched on August 3, 2004 at Cape Canaveral Air Force Station. It was aboard a Boeing Delta II rocket. After launch, the probe did several fly-bys and deep space manoeuvres to gain the right trajectory and speed. It completed 30% mapping of Mercury on January 14, 2008. MESSENGER made one more pass by Mercury in 2009, and on March 18, 2011 began to orbit Mercury. 100% mapping was completed in March 2013 and the probe continued its studies. On April 30, 2015, it crashed into Mercury. It crashed near the crater Janáček. ↑ Lee, Jimmy; Galuska, Mike (March 18, 2011). "NASA Chats – MESSENGER Prepares to Orbit Mercury". NASA. Archived from the original on June 7, 2011. Retrieved March 18, 2011. ↑ 7.0 7.1 "Launch Coverage: MESSENGER Mission". NASA. Retrieved 2011-07-30. This page was last changed on 28 February 2018, at 16:46.